1. Whisk the mustard, honey and vinegar together in a jug. Slowly drizzle in 2 tablespoons of the oil while whisking continuously until fully incorporated. Season to taste with salt and pepper. 2. Heat a large frying pan over medium high heat and add the remaining oil to the hot pan. Toss the prawns with the mandarin zest and cook for 4-5 minutes or until just cooked through. 3. 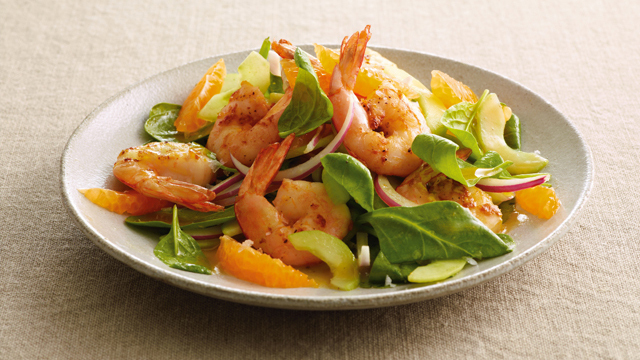 Toss the spinach, onion, mandarin segments and cucumber with enough of the dressing to coat. Mound the salad onto the centre of serving plates. 4. Top each salad with the cooked prawns and drizzle any remaining dressing over the prawns and serve. This entry was posted on August 7, 2010 at 8:17 am and is filed under Cooking, Family, Friends, Life, People, Personal, Random, Recipe. You can follow any responses to this entry through the RSS 2.0 feed. You can leave a response, or trackback from your own site. Gosh, I wish you lived alot closer. I’d love to come to your house for supper! my favorite kind of desert. Yummy! Great ingredients. Shrimp is one of my favorites. Mandarins and spinach leaves. What a great salad! Thank you for sharing. I couldnt stop thinking of it! Im so hungry now!!!! How can I stand this now!!!!! The is not a single day that I would refuse that, girl you are a domestic goddess!